All thanks to Blockchain, for fully providing us with a public ledger that can help with fund transfers and tracking. It appears to be Credits CS have transferred about 1 million usd to Binance wallets, possibly as listing fee. That gives the contract address (0x46b9Ad944d1059450Da1163511069C718F699D31) and contract creator (0x75433a0bd720f639d38bbea08f4632da831a1dae) where all the ETH during the ICO went. Now, a closer look at the outgoing transactions will show a transaction of 500 Ether to 0x17A6f036506BF29A7A50214f3dc93e4a1108708D which is said to be of Binance exchange. The same owner account tried to send another 250 which failed on the same day. 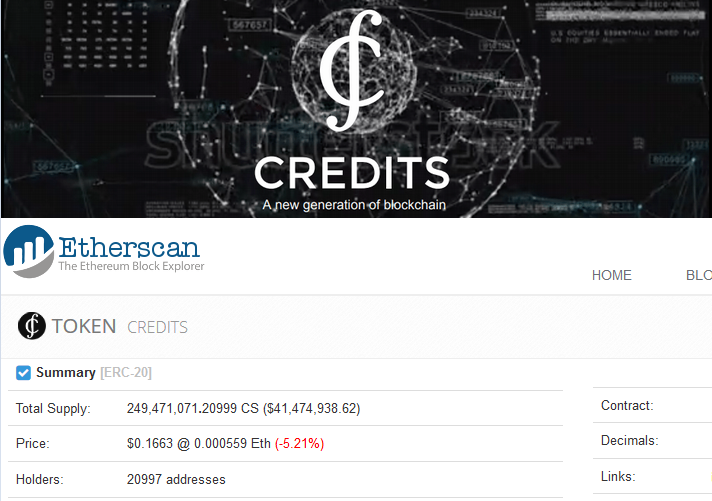 Now on the same day, two other transactions of 100 Ethers are sent to this address from CreditsMultisigWallet – which can be assumed from Credits too. That’s a total of 700 Ether sent on 2nd Mar 2018 – when ether was trading at around $900 on binance, that sums to approximately 6,30,000 USD. The new 4 transfers made three days ago sums to a total of 1190 Ether, which was trading at about $290 on binance that day with a total market value of $3,45,000. So with both the transfers it comes up to almost a million dollars – $9,75,000. And it’s totally visible there that all these funds are further transferred to binance official wallet. Connecting all these dots, could we expect Credit CS in Binance soon? Do share your thoughts in comments.